Providing Highly Sensitive, Low Power, Novel Mass Sensors. Miguel Ramos, co-founder of Sorex Sensors, on his journey from high school in San Sebastian, Spain acquired an in-depth knowledge of electronic fabrication and mass sensor technology. His Master’s Thesis at the Universidad Politécnica de Madrid with Professor Enrique Iborra related to the novel mass sensor technology that’s now being developed. Professor Enrique Iborra, who tragically passed away earlier this year at the age of 58, was head of the Group of Microsystems and Electronic Materials, GMME-CEMDATIC, Universidad Politécnica de Madrid UPM, Spain. “Professor Enrique Iborra was a major influence on my life; I learnt so much. Although I had more lucrative offers, I took up the opportunity to do my PhD with him and the GMME group. He was an inspiring academic who taught me extremely well. He was very hands on in the lab, doing experiments, as well as being an excellent communicator, fun, and team builder with a large worldwide network. I loved doing my PhD studies, it provided me with lots of opportunities and the ability to travel including two research stays in Cambridge, UK as a result of Professor Enrique Iborra’s relationship with Professor Andrew Flewitt. As a consequence of these visits, I took up my Post Doc at The University of Cambridge in June 2015. Professor Andrew Flewitt, an expert in the field, is an experienced academic who from the outset has provided me with many opportunities. He asked me to join him in various meetings that he was having with companies looking for sensors. As a result, in September 2015 Professor Andrew Flewitt and I had discussions with Cambridge Enterprise who have been instrumental in the formation of Sorex Sensors and we began shaping the company”. Sorex Sensors has licensed patents from Cambridge Enterprise and the University of Warwick and has ongoing collaborations with the University of Cambridge, the University of Warwick and the Universidad Politécnica de Madrid. Its core IP has been granted in the USA and EU. The sensors have an incredibly low power requirement, allowing them to be operated from a coin cell, battery, mobile phone or even by energy harvesting from an RFID device. FBARs are manufactured using standard MEMS processes and are currently produced in their billions for the telecoms industry each year as filters and multiplexers, rather than sensors. The measurement of film thickness in deposition systems used in electronics fabrication. Particle monitoring i.e. working with air filtration companies in respect of diesel emission particulates. Specific gas molecule sensing in consumer goods i.e. food decay. Sorex Sensors was founded by Professor Andrew Flewitt, Head of the Electrical Engineering Division, Dr Mario de Miguel Ramos and Professor Bill Milne at The University of Cambridge with co-founders Dr Marina Cole and Professor Julian Gardner from the University of Warwick and Professor Enrique Iborra from the Universidad Politécnica de Madrid. Mario De Miguel Ramos, is also delighted that Michael LeGoff has joined the team as CEO. Michael was previously CEO of Plessey and has over 25 years’ experience operating companies in the semiconductor industry. Michael’s connections in the investor network and his strategic thinking and experience will be vital for Sorex Sensors’ next phase of growth and commercialisation. Mario De Miguel Ramos met Michael LeGoff some time ago through an introduction by Uday Phadke, well known entrepreneur, Impulse Programme contributor and co-author of Camels, Tigers and Unicorns as well as The Scale Up Manual. The first Sorex Sensor product will be released early in Q2-19, the company will be raising further funds to support the commercialisation process and to grow the applications support needed. The MEMS based sensor is being produced in an 8-inch fab ready for mass production. Most of the ongoing development work is in application support including the development of demo kits and application notes to support design win activity. Sorex Sensors raised £1.2m seed funding in March 2018 from Cambridge Enterprise, Cambridge Angels and Cambridge Capital Group (over twenty business angels have invested). Dr Elaine Loukes from Cambridge Enterprise and Richard Parmee from Cambridge Angels joined the Board. Mario De Miguel Ramos attended a presentation about the Impulse Programme by Yupar Myint at The University of Cambridge, Engineering Department. He already had a business plan in place but felt that the programme would be extremely useful. He liked the idea of having a split programme, 3 intense days then a break and 3 further intense days and felt it made a lot of sense, allowing to him time to reflect and refine his ideas. Cambridge Enterprise also suggested that he should attend the Impulse Programme, as it is based at The Maxwell Centre which is at the very heart of the Cambridge technology community. The programme would provide him with the opportunity to make connections and network with many key entrepreneurs, business angels and financiers within the Cambridge eco-system. The University of Cambridge, Electrical Engineering Department generously agreed to sponsor him. “If you have the opportunity to participate in the Impulse Programme it is extremely worthwhile. Even though Sorex Sensors had a business plan in place we were able to enhance and improve it. Personally, I found David Cleevely’s session on team work extremely useful. Jamie Urqhuart was my mentor and I was part of his group. His experience as one of the founding team at ARM taking on various roles from Sales and Marketing to Chief Operating Officer when the company floated on the NASDAQ and the LSE, and latterly Chief Strategy Officer and now a venture partner at Pond Ventures investing in early stage companies, was irreplaceable. As a result of the Impulse Programme, Sorex Sensors is now based at the Maxwell Centre, Cambridge UK at the centre of the technology community. “Members of Sorex Sensors Advisory Board are from three universities Cambridge, Madrid and Warwick. Decentralised working is now possible with technology, regular monthly skype meetings, and email work very well. It must be fun, and you need to be willing to work and share expertise. You also need to be conscious of what time commitment each person can give, as well as their business network and the expertise they bring to the company. To succeed I believe you need to be humble and admit what you cannot do, extremely patient, continue learning, work with people who are experts in their field and ensure you get the right advice”. Mario De Miguel Ramos is excited at the prospect of their highly sensitive, low power, novel mass sensors allowing further technological developments. 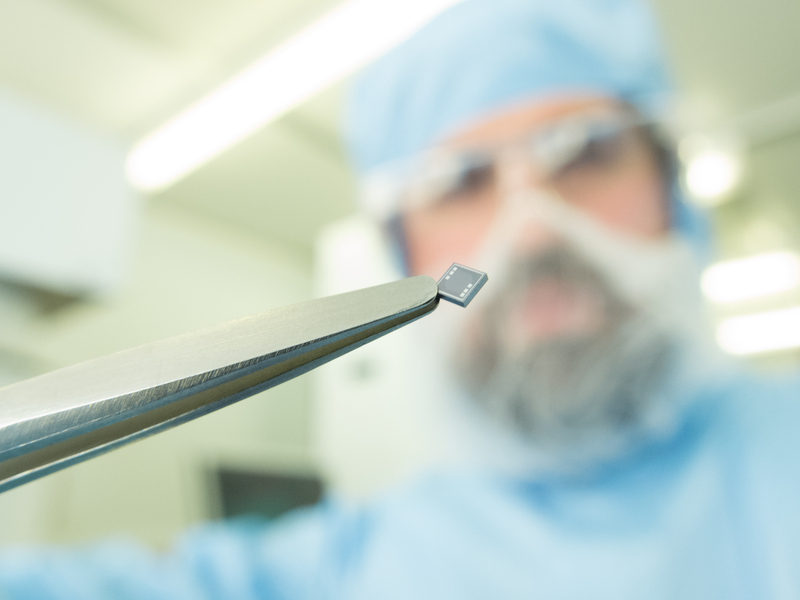 The size and ability for the sensors on the same chip to carry out different measurements provides interesting development opportunities.